Janelle’s team played their last game of the 2013/2014 seasontoday.Â Having clinched the league championship last game proved to be beneficial as they dropped today’s game by a score of 2-1.Â Regardless, they are league champions and will play in the European Champions League starting in the fall. 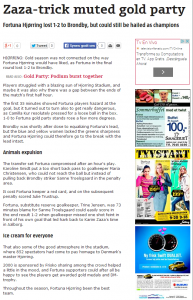 Click these links to go to articles about the post game festivities.Â Click the photo to advance to a new page that will allow you to cycle through several pictures in each link.Â Janelle is in a couple in the first link, and in several in the second. 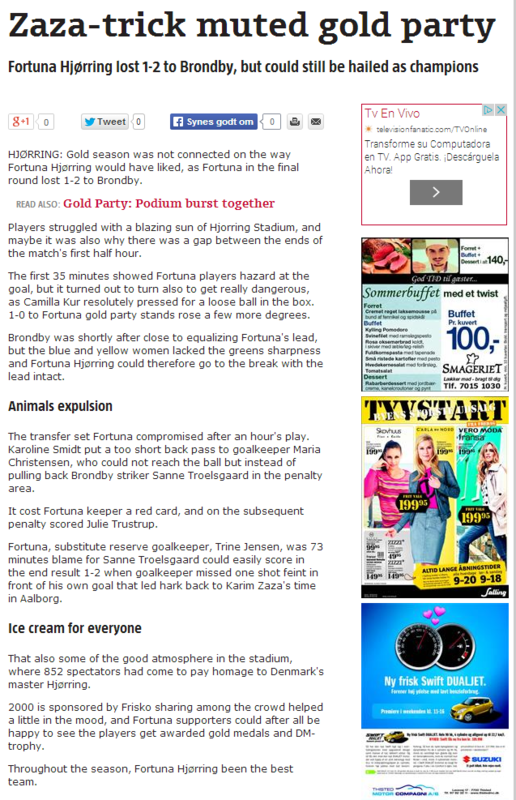 Included in the screen shots of translated articles below, is a nice article from the online newspaper that covered Janelle’s previous team. Here is a link to a video of the post game interviews and celebration from the game on June 1. 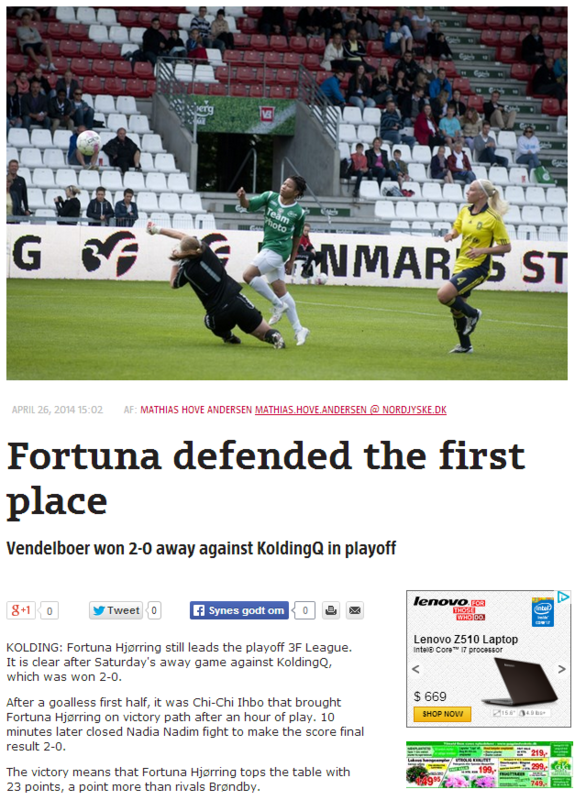 Â Â This was the game where Fortuna clinched the league championship. Â Janelle is interviewed just after the 6 minute mark. 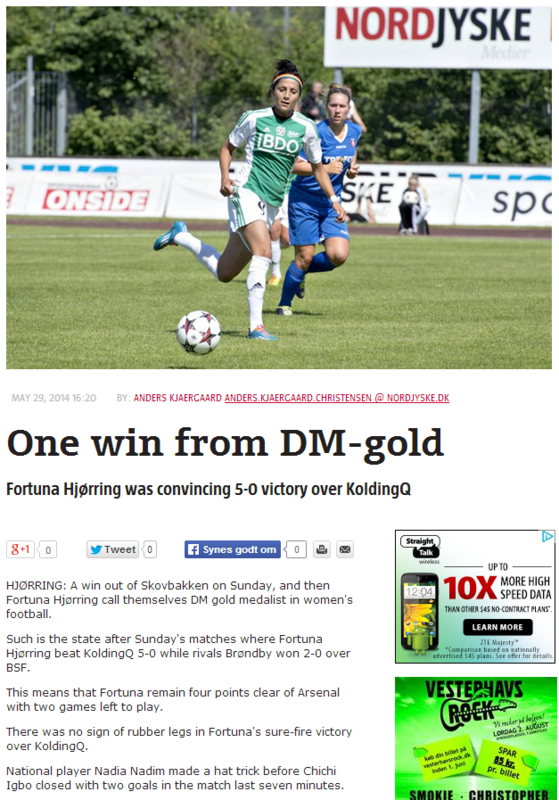 Janelle’s team played their third game in the past week today.Â With a 3-0 victory, Fortuna has clinched the gold medal for the season. 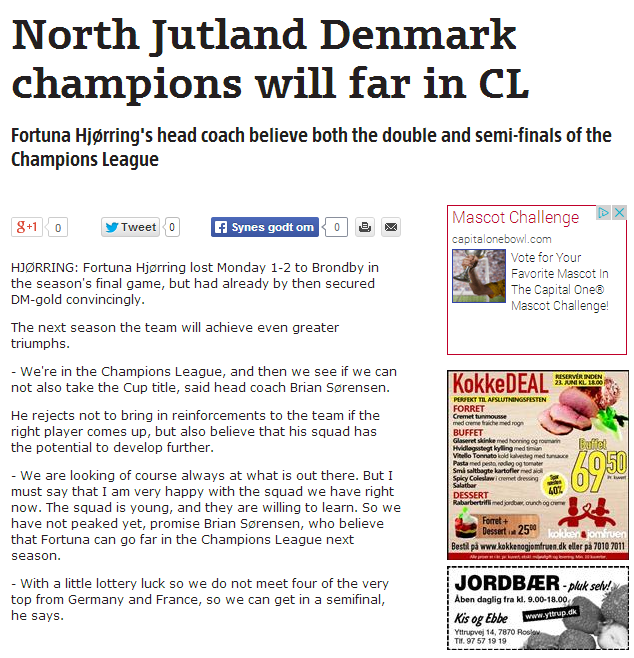 Â They will play the final game of the season next weekend. 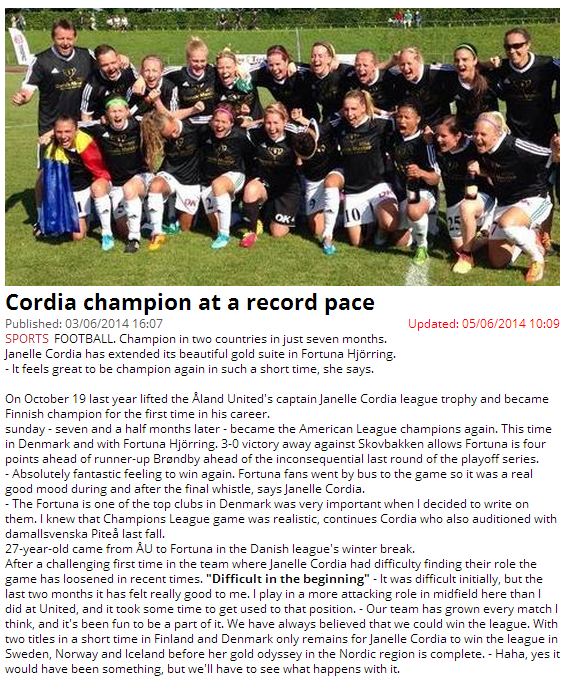 Janelle has now been a part of two gold medal winning teams in the past year.Â First with Aland United for the 2013 season in Finland and now with Fortuna Hjorring for their 2013/2014 season in Denmark.Â What an awesome experience for her, and I feel very fortunate that we are able to follow along for the ride. 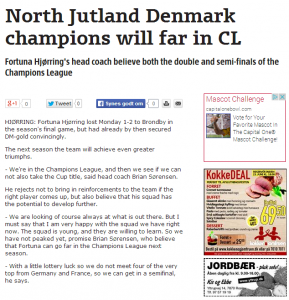 Click the images below to enlarge them for better viewing. 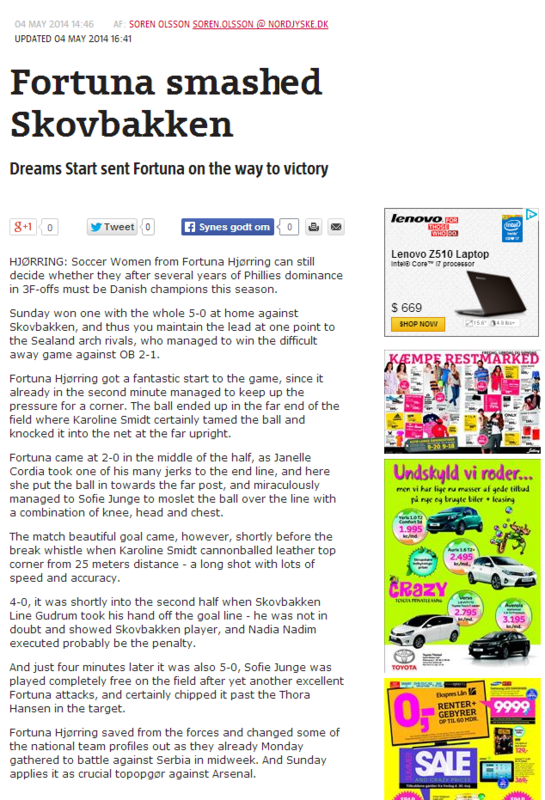 Janelle’s team played their second game of a busy week today, and came away with a 5-0 victory. 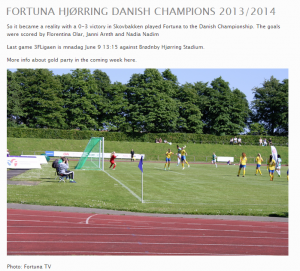 Â This win couple with Brondby’s win leaves Fortuna with a four point lead with 2 games to play. 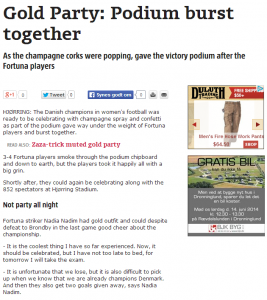 Â A win in Sunday’s game would clinch the gold medal for Fortuna. 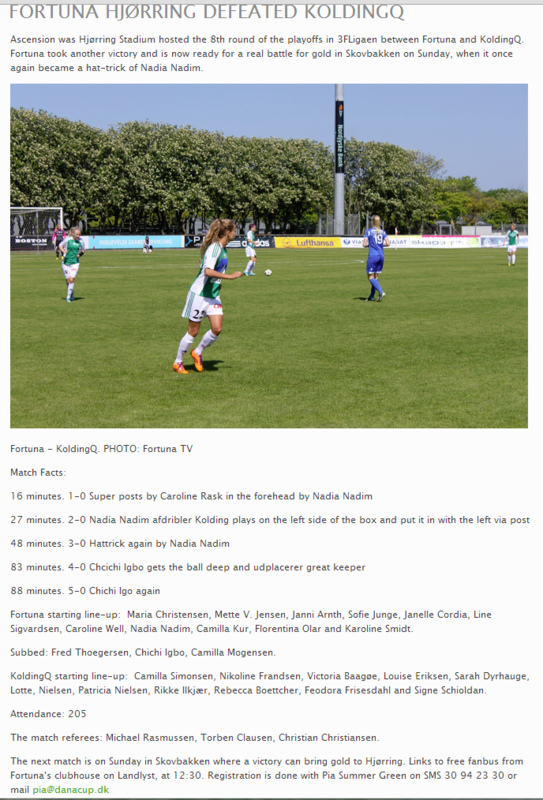 Today’s game was a 5-1 win for Fortuna. Â The team is still holding on to the four point lead in the league standings, with 3 games left on the schedule. Click the images below to enlarge for better viewing. Today’s game was a 4-0 win for Janelle’s team. Â They continue to hold on to a four point lead in the league standings. 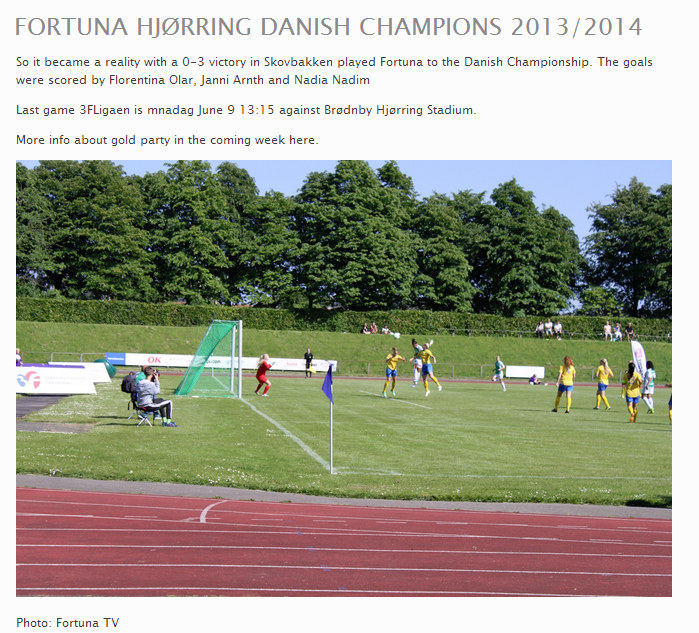 Today’s game was a hard fought battle with Fortuna’s arch-rival Brondby. 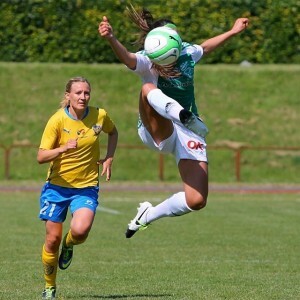 Â Even though the game was on Brondby’s home pitch, Janelle’s team was able to head back home with a 2-0 victory under their belt. Â Just a few minutes into the game, Janelle scored the first goal on a twisting header. 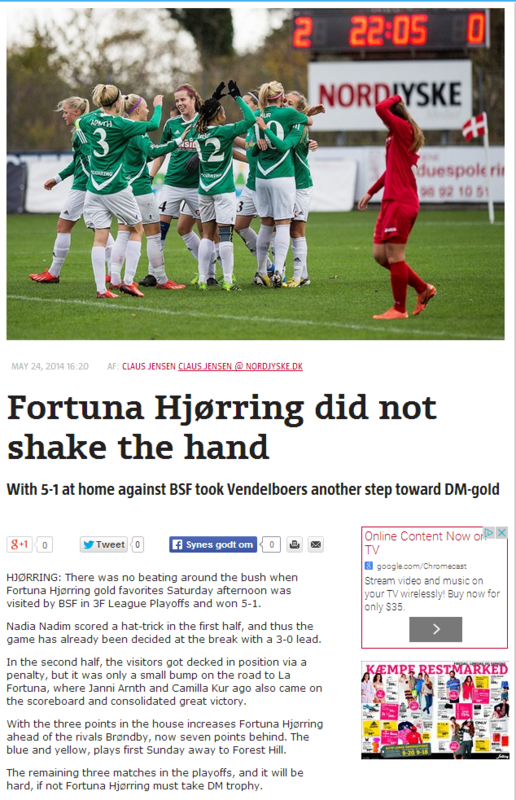 With this victory Fortuna now has a four point lead over 2nd place Brondby, with 5 games remaining on the league schedule. 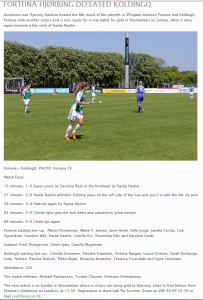 Fortuna came away with a 5-0 victory in today’s home game. Â They still sit in first place in the league standings by one point. Today’s game was a 2-0 road victory for Fortuna. Â They still sit in first place by one point with six games remaining in league play.